GPU computing has been developing very intensive since the only last two years. In the field of rendering, it all probably begun at Siggraph 2008 (or 2009?) 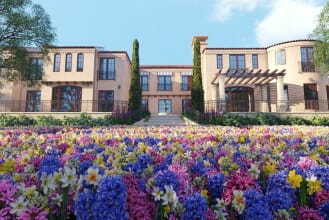 when Chaos Group presented their first shots of GPU rendering with new Vray version being worked on. Soon after that, many other GPU based renderers started to appear, and now many of common and vell developed CPU physically based rendering engines, try to find their sollutions in GPU computing. Why is it becoming so? Well, we may quote form NVidia website: "GPU computing is the use of a GPU (graphics processing unit) to do general purpose scientific and engineering computing. The model for GPU computing is to use a CPU and GPU together in a heterogeneous computing model. The sequential part of the application runs on the CPU and the computationally-intensive part runs on the GPU. From the user's perspective, the application just runs faster because it is using the high-performance of the GPU to boost performance." Why do I quote NVidia information and not for the example ATI? Because Octane Renderer which is the subject of this review, currently uses only NVidia's GPU CUDA technology, that allows us rendering on our GPU Card. At the moment it's much more efficient than OpenCL technology, which would allow us rendering on ATI graphics cards, but maybe someday it changes. We woun't be getting into many details here. Right now most developed GPU renderers use NVidia's CUDA technology only. The other interesting thing is multi-platform support, so we can run Octane under MS Windows, Apple Mac or even Linux! 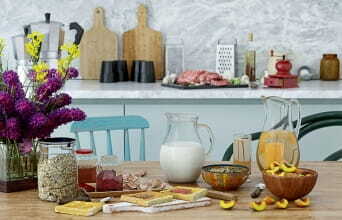 We are also not bound to any 3D software, because Octane works as standalone renderer. With currently developed plugins, we can link it to the most popular applications such as: Autodesk 3ds Max, Maya, Softimage XSI, Maxon Cinema4D, but also to Blender, Google SketchUp and Luxology Modo. Even more, if we work for example in any 3D CAD application such as ArchiCAD, we can export our model/scene to Wavefont .obj format, and then import it to Octane for material seup and rendering process. That is a very suitable solution for many studios or single users, because final output from 3D application needed in Octane, is just an .obj written file, which nowadays can be produced by almost every available 3D software. I think that's all about basic information, we'll now move to more technical stuff. 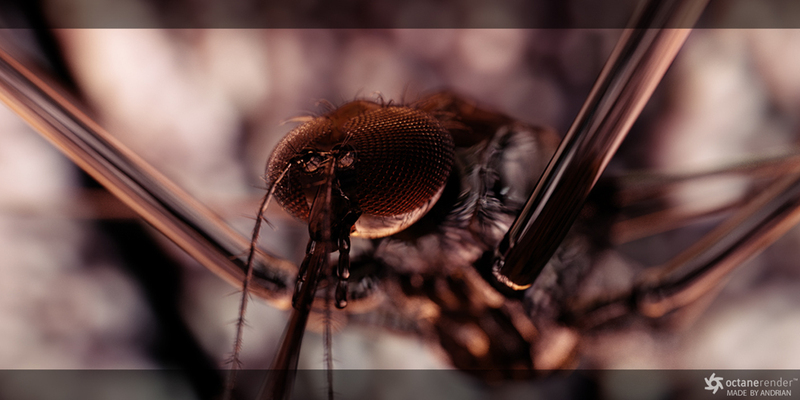 It just needs to be mentioned that Refractive Software also provides a DEMO verion of Octane Render which can be downloaded here (https://www.refractivesoftware.com/downloads.html), so You might give it a try and make Your own tests. Just be sure You have at least + GT8800 NVidia graphics card and latest CUDA drivers. You can check if Your hardware is compatible with CUDA technology by visiting this website (https://cuda-z.sourceforge.net/) and running the utility. Octane is currently in Beta state, but that doesn't make it useless or unstable at all. I might list all the already available features, but they can be found under this link https://www.refractivesoftware.com/features.html , so I'll focus only on the most important of them. 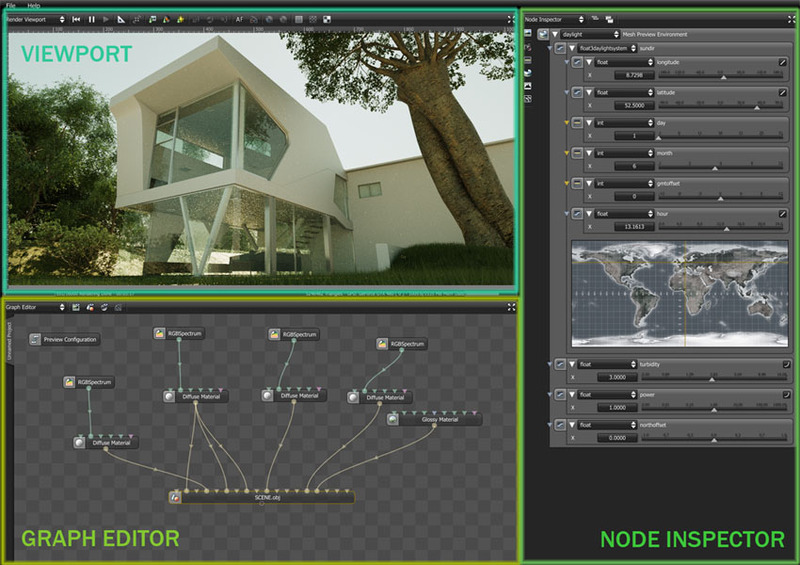 Octane's working area is divided into 3 sections - Viewport, Graph Editor and Node Inspector. As Octane is real-time renderer, each change is beeing automaticaly displayed in the viewport, so we have constant preview of how our final scene would look like. Everything is being done "on the fly", there's no need of time consuming, stopping and restarting processes like in normal CPU renderers - with an average GPU unit sometimes it takes just a few seconds, to have nice, clean render. Some material tweaking from evermotion on Vimeo. 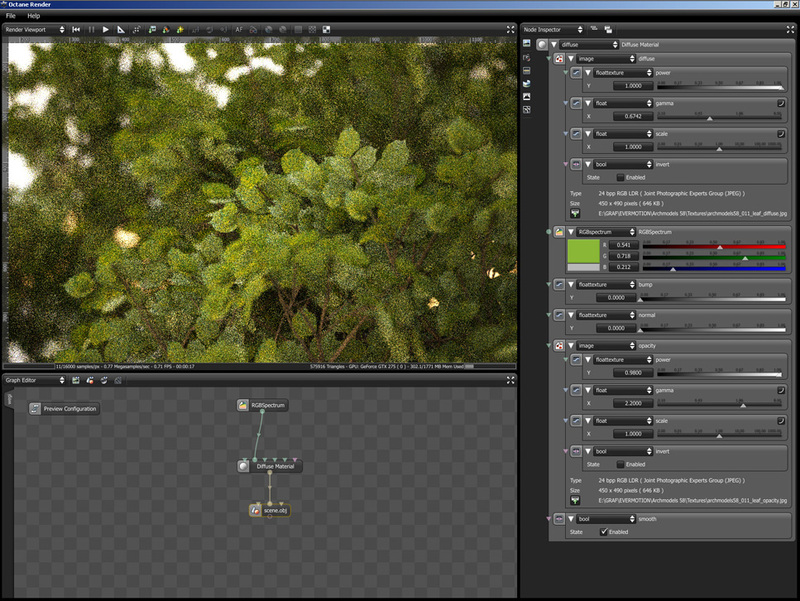 One cool and really interesting thing in Octane is ability to render stereoscopic images also in full real time! I personaly was very sceptic about all the 3d stuff that appeared lately, but believe me - Octane has really changed my mind. It's really a brand new experience to navigate your scene and have a real time preview in 3D. Quick Stereoscopic test from evermotion on Vimeo. The other panel is Graph Editor. It's directly linked to Node Inspector, and by using these two areas we can setup our materials, environment settings, camera etc. 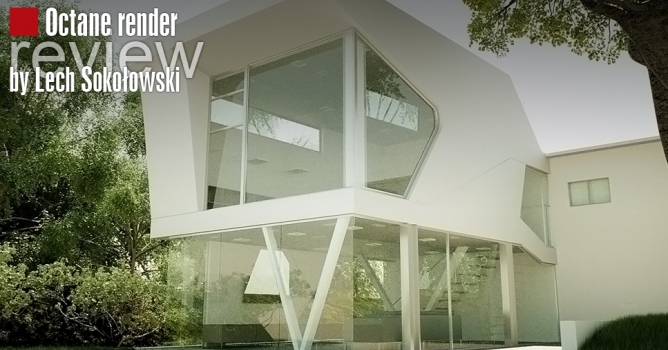 If you have used Blender or Autodesk Maya, you should be familiar with this type of workflow. Otherwise it would just take you a few moments to get used to i., Nodes are very intuitive way of setting up your scene parameters. Now we'll roughly look at the Octane's materials. 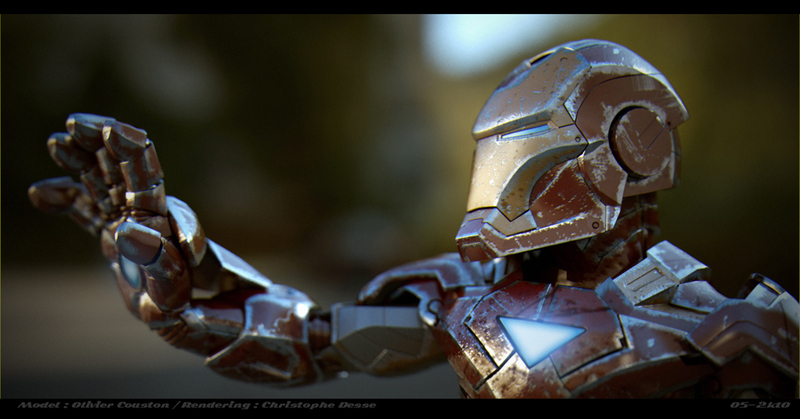 We have 3 basic shaders to choose from - diffuse, glossy and specular. It's quite different approach to material setup than in "classic" un-baised physical renderers like Indigo or Fryrender, where you can adjust your settings using layers manager. 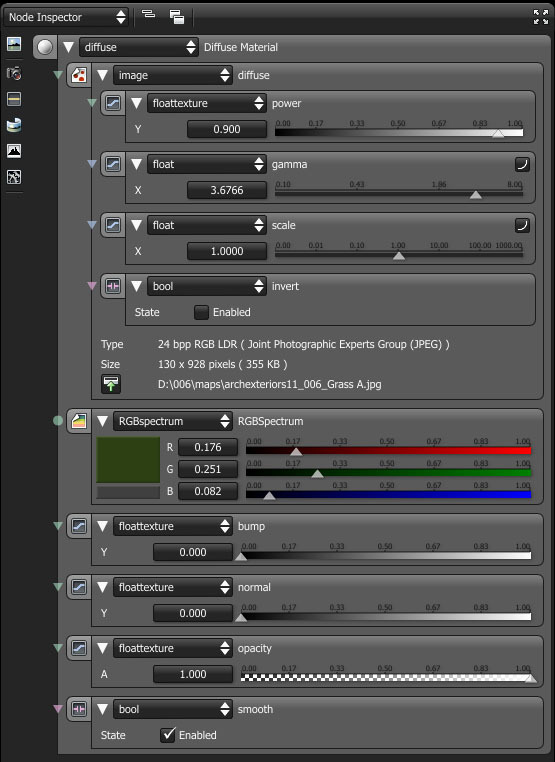 Here each shader has it's own parameters such as specularity, roughness, opacity etc. and many operators to control them. For example, in specular shader which produces glass material, one can put "gaussianspectrum" operator as a transmission controller, which gives really interesting results. Also, by creating a node setup in Graph Editor and joining diffuse shader with RGB Spectrum operator as a transmission controller, we can produce a translucent material. It may sound a bit complicated, but real time preview gives us much better opportunities to see the changes we make and adjust everything exactly like we want to. Now let's see camera setup. Currently in beta stage, Octane offers only normal, perspective camera with adjustable field of view and aparature size. Lighting tweaks such as ISO value, fstop or camera filters can be applied on the fly without the need of rerendeing the scene. They can be adjusted even after the rendering has finished. 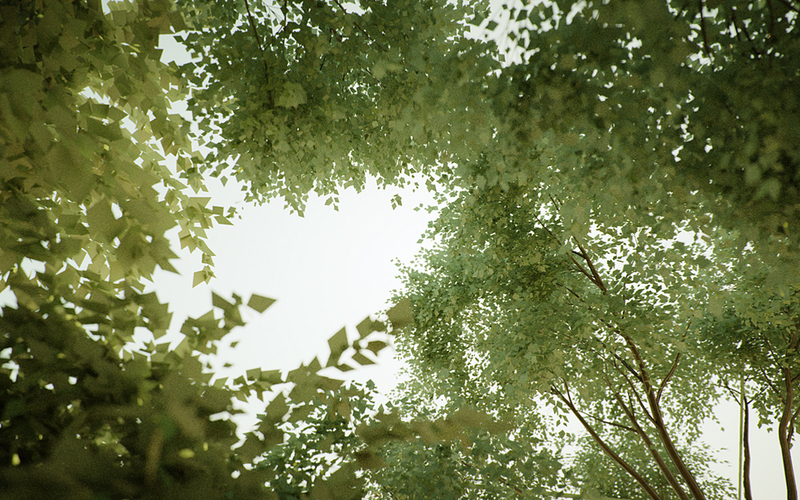 But probably one of the most interesting features is real time DOF adjustment. All we have to do is just to choose a "picker" in the viewport panel and click the object we would like to focus our camera on. This makes rendering process much more like playing a 3D photography than standard working with models and scenes. octane review video 02 from evermotion on Vimeo. 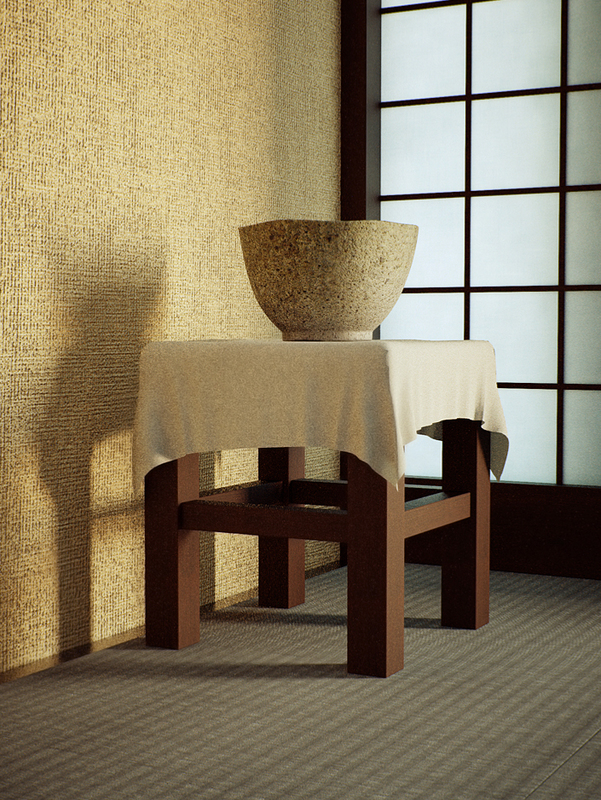 Octane is a physically based, un-biased renderer so it doesn't have many rendering settings to tune. At the moment we can choose between pure pathtracing and direct light method, which both have some basic options like raydepth, amount of samples etc. Mostly we don't have to be worried about any lighting bugs, because everything is being calculated like in the real worl. The only drawback is, that the current version of Octane doesn't yet support meshlights but that is claimed to be fixed in a matter of weeks since this review is being published. 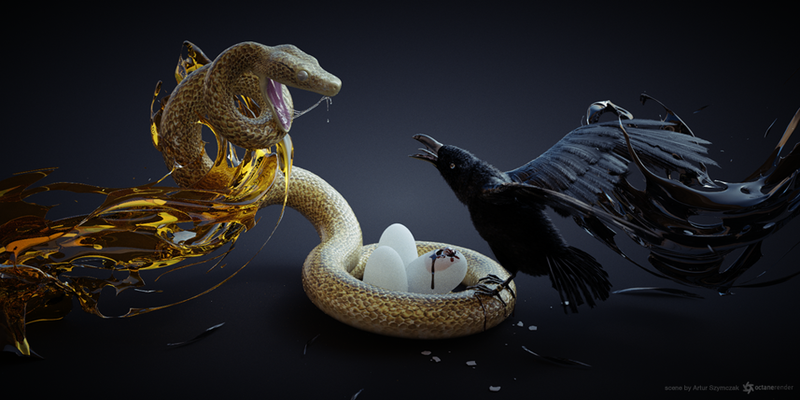 The most impressing thing in Octane are the rendertimes of images. You can see how fast Octane is, reading a short image specification under each render posted in this review. It works great no only on high end GPU's like GTX 480, but even GF 9800 can give your renders up to 10 times speed up! Onther great feature is build in post production which allows you to tune colormapping of the image, it's gamma, exposure, saturation and vigneting. Everything is being done on the fly, so we don't have to reload the image and render it again, which really saves a lot of time. Notice, that all renders posted in this review, are made almost without any postproduction in 2d applications (I've only resized some of the images, removed hotpixels and slighty reduced noise). Yet rendering in Octane has some small drawbacks. One of them is common "firefly" bug which produces so called "hot pixels" in the image. They must be manually removed in 2d application and mostly seem to be a problem of interior scenes. Someone might find it also troublesome, that GPU card use only its inner memory, which is usualy very limited. Actually Octane has very good methods of packing big scenes into GPU memory (i.e. scene of 5mln triangles with 2k textures has taken only 800 mb's of total 1500 mb's of memory on my GTX 480), but it might be a problem in bigger scenes, with lots of details, vegetation etc. Unfortunately, instancing isn't yet supported in Octane, so one needs to find a ways of omitting these limitations. 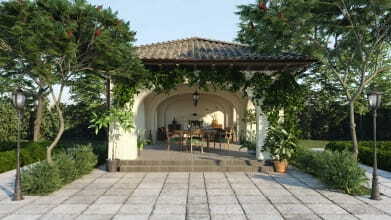 I used a vray dome light for the diffuse light in the exterior scenes as well as for the interiors. 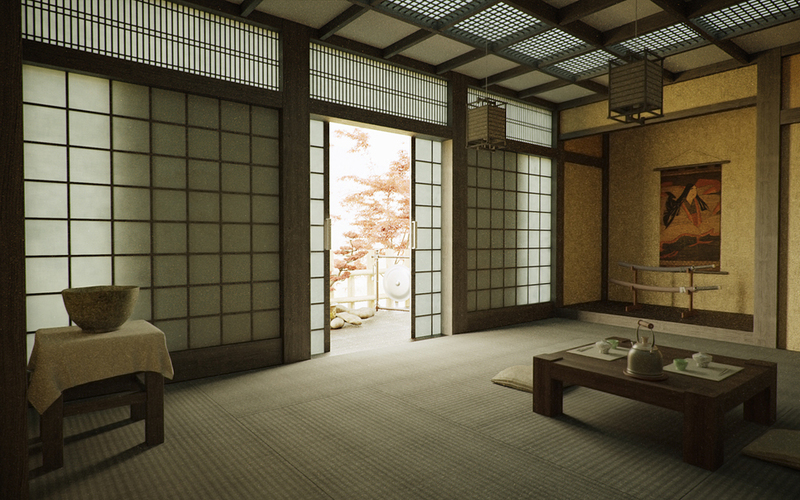 I couldn't have done it using vray planes in the windows as usual because this particular round interior has different openings from a lot of directions. For the texture slot I used an HDRI and sometimes only a bitmap. If there were any sunlight in the sun that was provided by a vray sun. FStormRender is a new GPU powered renderer. Jeff Patton compares compositing workflow of seven render engines: V-Ray, F-Storm, Corona, Octane, Mental Ray, Iray and Arion. Johannes Lindqvist covers the basics of this fairly new and easy to use GPU renderer for 3ds Max. 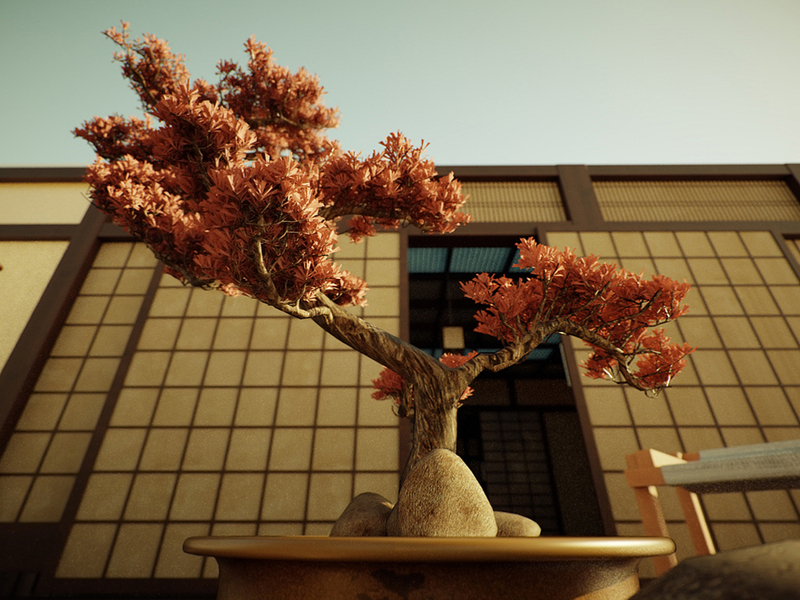 Path-tracing rendering with cinematic quality comes to Unity. 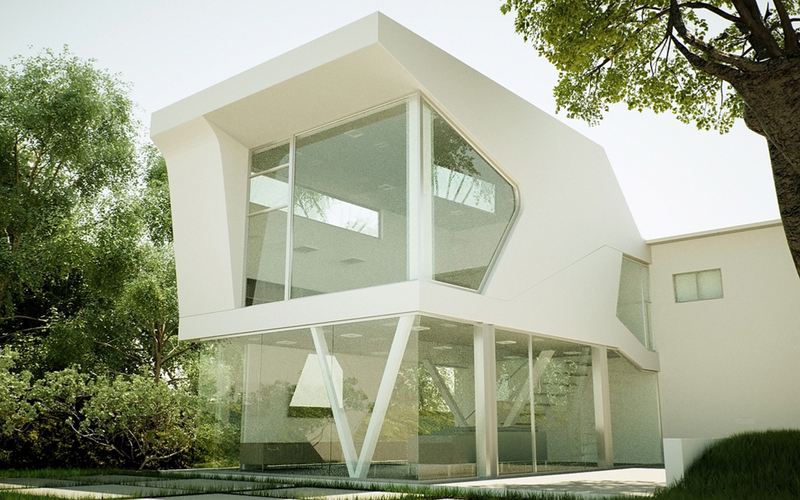 how did you use a vray dome light in octane? Great Article Thanks. Vray (light) in Octane is not supported I believe. Very impressive, but shouldn't GTX480 has 480 cores instead of 240? Is it how to calculator GPU cores, to divide it by half? Octane Render is a great engine, but it has some very important missing features when coming to animation! I think Octane Power Tools www.octanepowertools.com completes the circle by allowing camera and light animation in both realtime and saved renders mode.